I first set eyes on the former New Šančiai Synagogue during the winter of 2012-2013. I immediately fell in love with it, and for the last five years I’ve been experimenting with different ways of trying to take possession of the building with the intention of bringing it back to life as a world-class centre of memory, culture and education. After half a decade of getting nowhere, thanks to a combination of indifference on the part of Kaunas’s political and cultural elite and the fact that I’m not what you’d exactly call an expert on the subject, earlier this year I decided it would be a good idea to visit and photograph Lithuania’s remaining 100 or so former synagogues and to turn the experience into a book, a book that would hopefully encourage a much needed debate on the future of these sadly neglected buildings and that would also, through the process of writing it, teach me the various things I needed to know in order to bring the project to a successful conclusion. I left Kaunas on a misty Tuesday morning in August 2017 and returned twelve days later with several notebooks full of writing and almost 2,000 photographs taken on a simple mobile phone, my signature camera of choice for the last ten years. Along the way, I visited and photographed former synagogues in 59 Lithuanian towns, villages and cities whose contemporary uses include churches, funeral parlours, shops, hairdressers, a vehicle service centre where cars are repaired in between the building’s original bimah columns, and, in Telšiai, a former Beit Midrash that now serves as the office of the Lithuanian Member of Parliament Valentinas Bukauskas. Several others that I visited, among them buildings supposedly protected as objects of significant cultural and historical importance, lay derelict and dangerously close to ruin. Thanks to the hard work of a disparate group of Lithuanians, four have either been or are in the process of being converted into inspiring places of memory, culture and education. I’m still working out exactly what I think and feel about the experience (a situation that writing the book will undoubtedly clarify), although it already seems obvious to me that it’s not necessary to a possess a deep understanding of the subject in order to realise that there must be more appropriate ways of using these extraordinary and beautiful reminders of Lithuania’s rich multicultural past than some of the examples given above. According to Jewish law or halakha, a synagogue is a place where ten males are permitted to gather for prayer. A former synagogue, on the other hand, is something else entirely. In New York, they convert former synagogues into nightclubs and nobody complains, but this is in a city whose large Jewish population has become increasingly secularised over the last century or so. Closed during the first Soviet occupation of Lithuania between 1940 and 1941, and permanently depopulated by the Nazis and their Lithuanian accomplices during the Holocaust, the various contemporary uses of Lithuania’s violently emptied synagogues, on the other hand, whose former congregations lie buried in mass graves all over the country, need to be, in my opinion at least, openly discussed. Unfortunately, controversial issues in Lithuania (and I’d argue that holding Catholic Mass inside a building whose original inhabitants were slaughtered within living memory qualifies as being controversial) remain just as taboo today as they were during the dystopian days of Soviet rule. 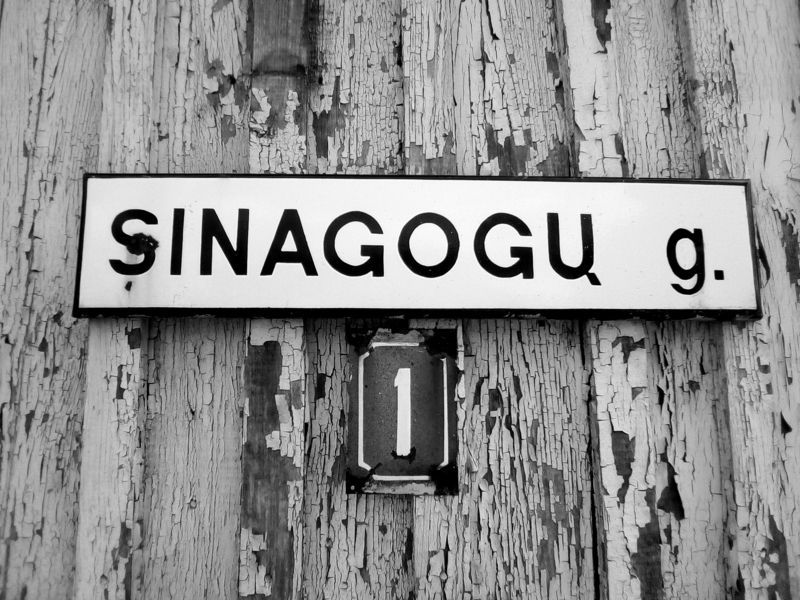 In my adopted city of Kaunas, where over 35,000 Jewish men, women and children from all over Europe were murdered during the Holocaust (and where it’s now almost impossible to gather ten Jewish males together for prayer), seven of the forty or so synagogues that existed before the war are still standing, among them the one I’ve been trying to take possession of for the last five years. Enlarged and converted into the Orwellian-sounding Bakery Nº9 in 1946 and closed soon after independence in the early 1990s, the New Šančiai Synagogue, which dates from 1932, is a crumbling interwar masterpiece of the kind Kaunas’s political and cultural elite like to remind everyone they’re extremely proud of. Today the building is used by the owner of a neighbouring sock factory, who stores cardboard boxes inside it, and who, when my NGO organised a week-long event in the building last year to commemorate the 75th anniversary establishment of the Kaunas Ghetto, did everything he possibly could to try and stop us from holding the event. It seems to me that the owner of the sock factory isn’t a bad person, he just hasn’t been educated about the building and the fate of the Jews who once used it. It’s not his fault, and he’s certainly not alone in his ignorance. In Kaunas, where Lithuanian Jews lived for centuries, and whose countless contributions to the development of the city have been almost entirely airbrushed out of the historical narrative, there isn’t a single place dedicated to remembering them in their complex entirety. With the exception of the Sugihara House, which doesn’t really qualify as it focuses almost exclusively on the lives and experiences of non-Lithuanian Jews, everywhere else is Holocaust-focused, which does nothing more than reinforce the image of Jew as a one-dimensional victim. As Lithuania prepares for the centenary celebrations of the signing of the Act of Independence in 1918, it seems more appropriate than ever to start breaking the taboo, and to introduce the next generation of Lithuanians to the broad and inclusive history that the vast majority of the country’s schools are failing to teach their students. The best way to do this, it seems to me, is by taking possession of a former synagogue and bringing it back to life as a world class centre of memory, culture and education. Whether that building turns out to be the former New Šančiai Synagogue or another building remains to be seen. *From an Old High German word meaning “school”, shul is the Yiddish word for synagogue. Although commonly believed to be a house of worship, a synagogue is traditionally not only a place of religious observance but also of education and community.